An International Falabella Miniature Horse Association dedicated to promoting and preserving the rare Breed of Falabella Miniature Horses all over the World. QUESTIONS ? PLEASE E-MAIL US TODAY ! The Falabella is a rare Argentinian breed of Miniature Horse that has been kept pure by breeding only pure Falabellas to other pure Falabellas for countless generations. It is known as the first and original Miniature Horse breed, yet the miniature size is secondary to their pure heritage. It is a true purebred due to their unique and historic ancestry, which is one of its greatest attributes. The other is the fact that the Falabella name is known and recognized all over the world. Breed ancestry has been kept pure by the Falabella Farm and by small groups of dedicated breeders who want to preserve their precious heritage. The Falabella is an exquisitely unique horse that has always been rare due to the limited number within its pure ancestry gene pool. Estimates indicate that only a few thousand Falabellas exist in the entire world. The most desirable feature of the Falabella and its primary value is that of its rarity and pure Falabella ancestry. Falabellas are very prestigious to own and are highly prized by those who have them. Many historic facts and fables have been told of the famous Falabella in books, magazines and equine articles. It was said that the original Argentine little horses were descendants of Andalusian and Spanish Barb horses brought to Argentina by the Spaniards when they first arrived in the 15th century with the intent to conquer Argentina. They were defeated and the horses were left to roam free. Over several more centuries the harsh environment and inbreeding caused a reduction in size and produced naturally small horses. Back in the 1840s, these small equines were seen within herds near the southern Buenos Aires area by Patrick Newell and he started to build his herd with the smallest he could find. It was from this point that selective breeding was started to develop a true small horse. This was over 150 years ago. Patrick Newell worked with the small horses and his knowledge was passed to his son-in-law, Juan Falabella. Juan shared his knowledge with his son Emilio, who passed it on to his son, Julio Falabella. As Julio worked with his father through his younger years, he gained all the knowledge his father had learned throughout his lifetime. Over many years they used a variety of equines. This included the native Argentine Criollo horse and equines with Pinto and Appaloosa markings to breed down in size, continually keeping the smallest and best quality in each generation. By the 1950s, Julio took over his fathers Falabella Farm. He had created tiny sized Falabellas in every color including Pintos and some very rare and colorful Appaloosas which were his favorites. The greatest development and perfection of the Falabella breed was done by Julio when he created his tiny horses in many colors. With his dedication and knowledge, he was able to produce perfect little horses that were some of the smallest in the world. Once the tiny sizes in all the colors were attained, a century of natural heritage and breed development was completed. Julio set out to show his Falabella Miniature Horses to the world ! When Julio passed away in 1980, the Falabella Farm, and his life's work was continued in Argentina by his wife, Maria Luisa de Falabella, their son Julio, and daughter, Maria Angelica Falabella. In 1995 Angelica then later moved to South Carolna in the United States and brought her very best Falabellas with her, including her smallest and most colorful Pintos and Appaloosas. 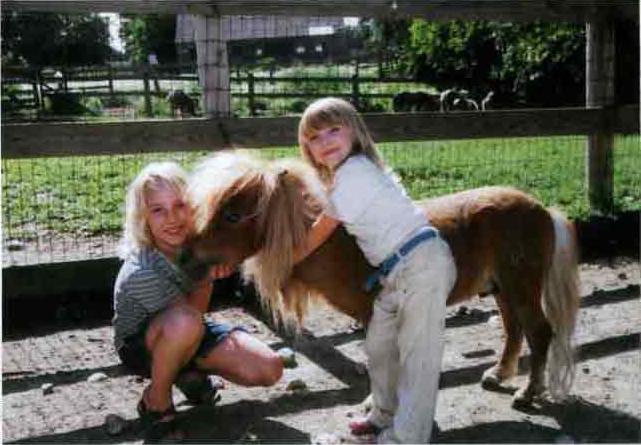 Both Falabella Farms continued to be a primary producer, and exporter, of Falabella Miniature Horses all over the world until Maria Angelica Falabellas retirement in 2006. Upon Angelica Falabellas’s retirement in 2006, Laurie Stevens of Toyland Miniature Horses, acquired Angelica’s entire herd. Most were the special picks which Angelica kept for herself and imported to the USA. Some were very small Falabellas, size 26 inches to 30 inches. Their bloodlines go directly to the Falabella horses of Argentina. These are the last of the Angelica Falabella herd from her South Carolina Ranch. Currently Falabellas are still at the Falabella Farm in Argentina and others are located in the United States, Canada, Europe, the United Kingdom and a number of other countries all over the world. The most famous Falabellas in the United States were a group imported from Argentina to the Regina Winery in California, in the mid 1960s. Referred to as "Lilliputian" (which means trivial or very small) Horses, they were used for promotional purposes. One of these they named "Chianti" after one of there prized wines. A beautiful black Leopard Appaloosa stallion. He became an immediate sensation and has since been written about in many equine news articles. Chianti and his mares produced some of the first Falabella foals born in America and some of the very first Appaloosas within the Miniature breed. One of the best known and finest sires in the USA was Toyland Zodiac, a 31 inch top quality, black Leopard Appaloosa Falabella stallion born in 1976. Toyland Zodiac is the leading sire and grandsire of more show quality and top winning offspring than any other Falabella stallion in the USA. Some of the most beautiful and finest quality Falabellas have Toyland Zodiac in their ancestry. In January of 2016, Sony Pictures released "Apple of My Eye". A heartwarming tale about Bailey (Avery Arendes) who is a talented young teenager who tragically loses her sight in a horse riding accident. Her devoted parents, Caroline (Amy Smart) and Jason (Liam McIntyre) do everything possible to help her adjust, but she's unable to connect to anyone or anything. That is, until she meets Charlie (Burt Reynolds), a Guide Dog Trainer who introduces her to Apple, an affectionate miniature horse, who becomes her new eyes - and new best friend - in this inspiration film for the whole family. * "Apple the Movie Horse" is a pure Falabella miniature horse. Born Toyland Crimson, on May 20th 2015. She is a great granddaughter of Toyland Zodiac. Specializing in Falabellas is a popular choice for those who are looking for something unique and different. A growing number of Miniature breeders and other horse breeds are adding Falabellas to their farm as they see the many advantages in breeding these rare little horses. They are available in every color, giving a wide variety of choices. They can be registered and shown in competition in all Miniature Horse shows, and in all Miniature Horse Registries in the World. Most importantly they have their own FMHA Registration certificate to authenticate their historic ancestry. With many top farm names coming and going over the years, the Falabella name has withstood the test of time and has retained its status. Falabellas are known and shown world wide and the name creates its own market which is a unique advertising and promotional advantage available to Falabella breeders. Some Falabellas can be expensive and carry premium prices, however, most can be acquired at affordable prices. Foals are especially desirable and can cost less than adults. They are a good choice for those who want a few or are looking to acquire future breeding stock or show prospects. There are less than 2000 Falabellas registered in the FMHA since its incorporation in 1973. Only small herds are known to exist in the USA and most other countries, and their number is estimated to be only several thousand in the entire world. There is a strong demand and limited supply due to the small number in existence. There are distinct differences between Falabellas compared to American Miniature Horses. The rarity and purebred Falabella ancestry of every Falabella is what primarily sets it apart from all other Miniature Horses. All Falabellas originally came from the Falabella farm in Argentina and they still continue to breed and export their Falabellas around the World. The Falabella Farm in Argentina has developed its own Association de Criadores de Caballos Falaballa (ACCF) Registry, in which they record the original ancestry of their Sires, Dams and offspring born on the Falabella Farm. When a Falabella is imported from Argentina, they have an ACCF registration document which authenticates their Falabella Farm heritage. The Falabella Miniature Horse Association (FMHA) was incorporated in 1973 as the first Falabella Miniature Horse Registry in the World. By this time, Falabellas were already becoming very popular and a number of breeders were importing them to the USA and other parts of the world. With continued importations of Falabellas and additional offspring being born, there was a need for a Registry to record and authenticate their pure Falabella ancestry, thus the beginning of the Falabella Miniature Horse Association. The Argentina ancestral Pedigrees were recorded and FMHA registration certificates were issued to all pure Falabellas and their offspring. Today, FMHA continues as an International Falabella Registry for Falabellas all over the World. Only pure Falabellas are accepted for Registration in FMHA. They must have an FMHA registered Sire and Dam or must have documented proof of every ancestor tracing their original ancestry to the Falabella Farm in Argentina. FMHA honors all pure Falabellas with Regisration certificates from imported Falabellas with ACCF registrations from the Argentina Falabella Farm and from other Falabella Registries in other Countries. The Falabella Registry, American Registries and other Miniature Horse Registries. An additional and important plus is that most Falabellas in the USA are also registered in the American Miniature Horse Association (AMHA) and/or the American Miniature Horse Registry (AMHR) and Falabella offspring can be triple registered in AMHA, AMHR and FMHA. This gives owners the opportunity to register, breed and show their Falabellas in the Registries of their choice and still maintain a pure Falabella breeding program. The American Miniature Horse is extremely popular and has become one of the top choice Equine breeds. Proof of their popularity is shown as the count of AMHA and AMHR Registrations well over 230,000 since their inception. In comparison, there are less than 2,000 Falbellas registered attesting to their rarity. Pure Falabellas make up only a tiny part of the growing number of other Miniature Horses, however, they are a big attraction for Miniature horse breeders and Falabella Fanciers. Winners Ribbons, trophies and special awards can bring show titles, recognition and added value to your Falabellas. Falabellas can compete side by side with other Miniatures for winners ribbons and National titles, and some have taken top awards on an International basis. Falabellas are sweet natured and enjoy being with children, adults and seniors. They are becoming extremely popular as guide horses and therapy horses. Their small size makes them easy to handle. They are easy to train to drive and fun to show. They can also provide family enjoyment as a beloved pet or companion for anyone, from tots to teens, and adults. Foals are especially adorable and affectionate making for a very unique and precious equine. They are versatile in many ways and can do all the things that any Miniature Horse can do. Most can be ridden by small children. They are quite intelligent and can be trained to do so many things. They are strong for their size and driving them is very popular, especially in shows and parades. The quality of a Falabella is most important, having an overall appearance of a well balanced horse with a pleasing look, good legs, a good bite and good conformation, the same as required to show. Falabellas with the finest show quality are highly desirable. All breed types are acceptable for the Falabella. As development of the Falabella evolved, selective breeding has created a variety of types. Some of the most popular Breed types seen in Falabellas are the Arabian, Thoroughbred, Quarter Horse, Pinto and Appaloosa, but the most important factor will always be their pure Falabella ancestry. Emphasis has been toward breeding for refinement, well balanced conformation and the look of a true horse in the breed type they resemble. Birth heights can be as small as 12 inches and up to 22 inches or more, and mature heights are usually attained at 3 years of age. Since they are naturally a small equine breed, mature heights can be 25 inches to 34 inches and over but most Falabellas mature in the 27 to 34 inch height range. All sizes are accepted for registration in FMHA. In essence, size does not take away from their pure ancestry or their value. The Falabellas pure heritage has always been the first and foremost reason to acquire them. Once a pure Falbella is accepted for registration, they remain registered in FMHA for life. The Falabella comes in all solid colors and a wide variety of colorful Pinto and Appaloosa patterns. Rare Pintaloosa patterns can also occur, showing both Pinto and Appaloosa markings. Some of the most colorful are in strong demand but limited in number. Because of their rarity, the primary reason to have Falabellas is to protect and preserve the breed through dedicated breeding and keeping the bloodlines pure, but secondly, specializing in the Falabella bloodline gives a great marketing advantage since there are a small number of Falabella breeders but a large number of potential buyers who have Miniature Horses. In a business sense, Falabellas can be acquired to start a small horse farm which can generate a yearly income in addition to your own job or business. It also offers farm tax benefits and can give a higher, safer and longer term return than some other investments. Foals have good value and are adorable and fun to raise. Additionally, foals will increase herd value if kept, or can generate income each year through sales. Feed costs are low and returns are high! A one time investment for each Falabella can give returns through foal sales for 20 years or more. The Falabella is truly a special breed to consider. Thank you for your interest in the Pure Falabella Horse. Please contact Laurie and Laureen Stevens if you would like more information on this truly unique and rare breed!